There aren’t very many New York City apartments these days that could justify an entire book. 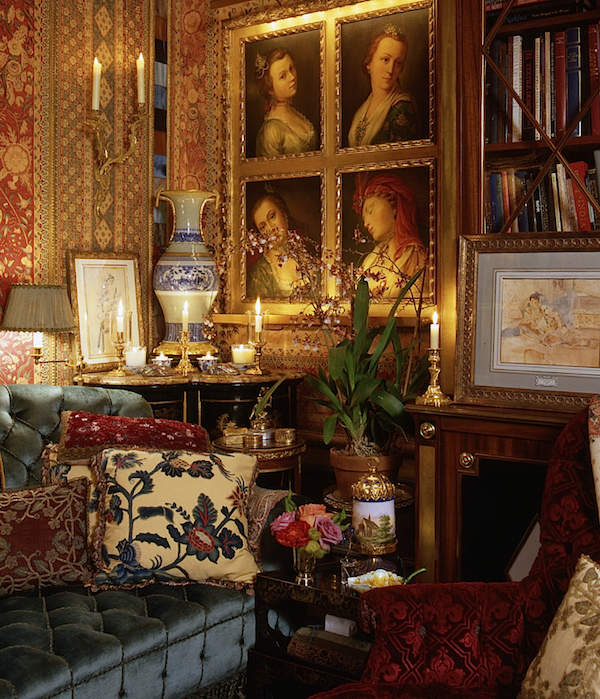 But then again, there aren’t very many apartments like the one owned by interior designer Howard Slatkin. 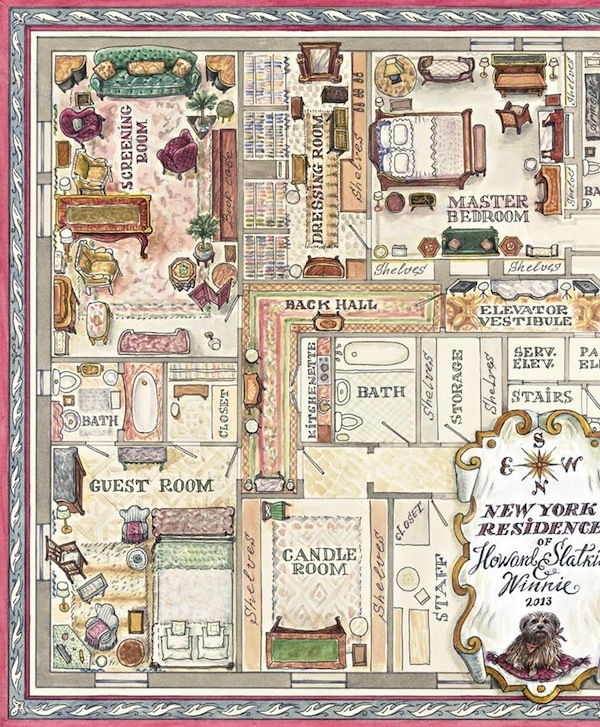 In a six thousand square foot aerie overlooking Fifth Avenue, the designer has created a dream home worthy of a royal residence.With totally bespoke interiors of breathtaking craftsmanship, Fifth Avenue Style celebrates not only Slatkin’s creative vision and passions but his love of the handmade and the gifted artisans with whom he works. Susanna and I are thrilled to share our behind the scenes visit to this remarkable apartment. The book is the perfect reflection of its subject. Every element has been carefully considered to enhance the reader’s aesthetic experience. The handsome dust jacket is of unusually heavy stock featuring Howard’s monogrammed pattern on the inside – rather like the luxury of wallpapering the inside of your closet. Endpapers with hand drawn illustrations, a section shown below, welcome you with charm and elegance. Even the copyright page is thoughtfully placed at the end, to not mar the experience of your vicarious visit. And of course the experience is enhanced by the beautiful photography of Tria Giovan. As someone whose life revolved around books and design for many years, I can assure you, this volume is a rare jewel of both content and production. It is impossible not to revel in the detail of every custom designed layout and exquisite border, with pages simulating just the right off-white shade and texture of classic laid paper. Each chapter’s colors reflect the scheme of the room so the chalky grays and creams of the gallery and living room are registered in those sections’ borders as illustrated below. While the apartment’s craftsmanship and attention to detail are of a rarified quality, the book’s sensibility is refreshingly approachable, with humor and a pronounced practicality. From clever construction concepts, to design and entertaining tips, Howard Slatkin shares his ideas on how to make a home not only beautiful but comfortable and most importantly, functional. The chapter on the living room begins, “Welcome to my bowling alley,” but he goes on to explain his multi-layered solutions. Starting with the point of departure for each room, every element is carefully documented to explain process and production. 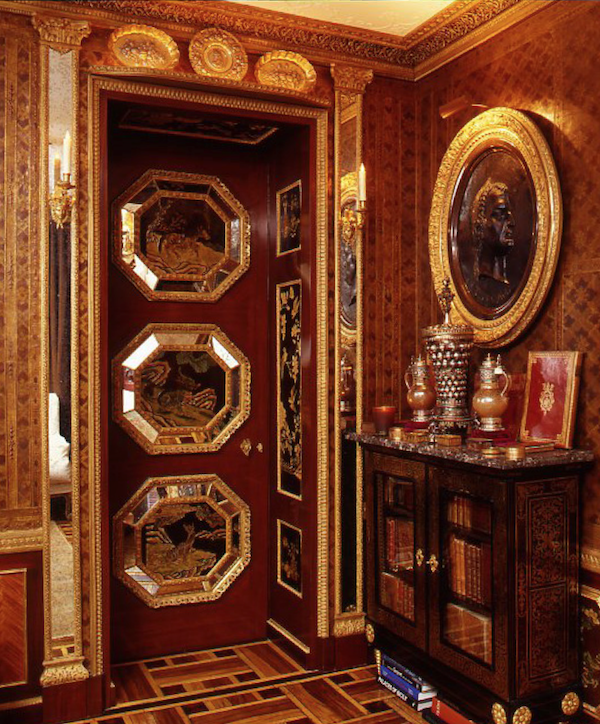 We learn that it was a box of caramels from Fouquet that inspired the palette of the library, from the inlaid floor to the mahogany door, dado and leather-clad walls. 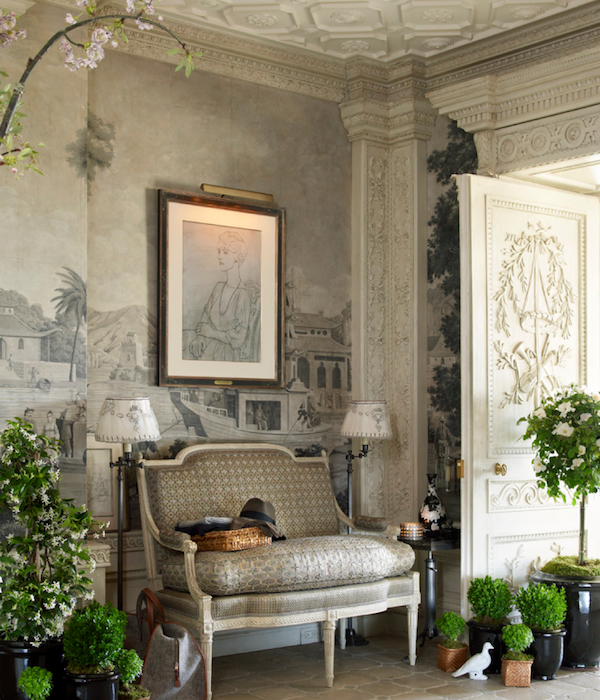 Every room tells a story, like the gallery, with the amazing find in Paris of the antique French scenic wallpaper panels now paired with the Stéphane Boudin designed, Maison Jansen executed doors, a gift from the Palm Beach estate of Mrs. Charles Wrightsman. And while you may feel like you’ve entered the apartment via Paris, the other rooms take you on more exotic journeys. The screening room is like a “turquerie with a sprinkling of the Raj, hints of old Persia, a whiff of Samarkand and Egypt, and echoes of the orientalist paintings of John Frederick Lewis and Jean-Étienne Liotard.” And it is just as tantalizing in person – perhaps even more so! Having lunch in the magnificent dining room was like being transported to St. Petersburg. While the inspiration may have been French Empire, I was Anastasia for the afternoon. And the guest room is a sanctuary of feminine froth and embellishment. I can’t imagine anyone every wanting to leave. It is with great generosity that in the back of the book, Howard celebrates his favorite artists and shares all his sources. For this is the heart of his passion – the love of the handmade, the art of the bespoke and the quality of craft. This is not a book to merely read but to experience. I have shared just a bit. You will get lost in the pages, as we did in the apartment itself, marveling at the beauty, workmanship and incredible creativity. And while few can even imagine living on this level, there are ideas to be gleaned and design lessons to be learned. 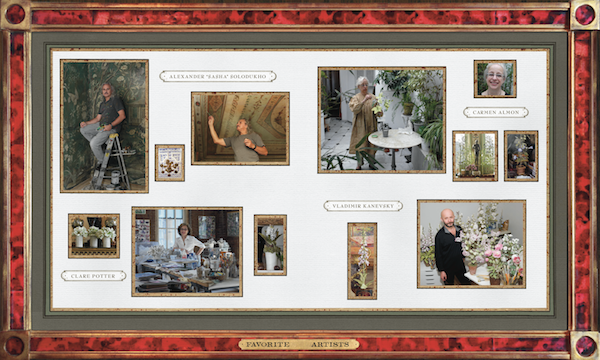 A huge thank you to Howard Slatkin for his hospitality and thoughtfulness – it was a day of delights. This entry posted in architecture, At Home with, books, design, food and drink, furniture, interior design, Quintessence video series, Stylish Shopping. 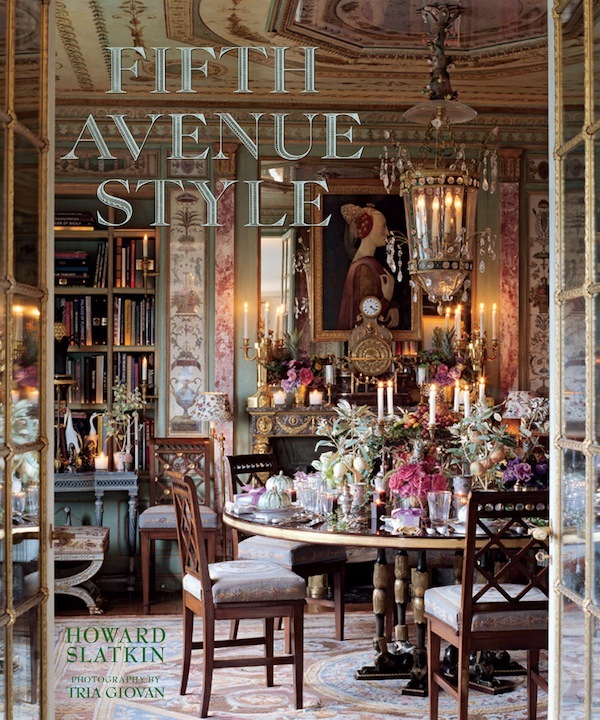 Entry Tags: At Home with, Design Books, Fifth Avenue Style, interior design, Luxury, NYC Bookmark the permalink. Absolutely magnificent, and yet so personal and comfortable. Thank you for the video, and we’re ordering the book immediately! Magnificent! I’m in a pairing down, simplifying design mode, yet I find Howard’s home enchanting and inviting. The book looks like a continuation of the close attention to detail. How divine! 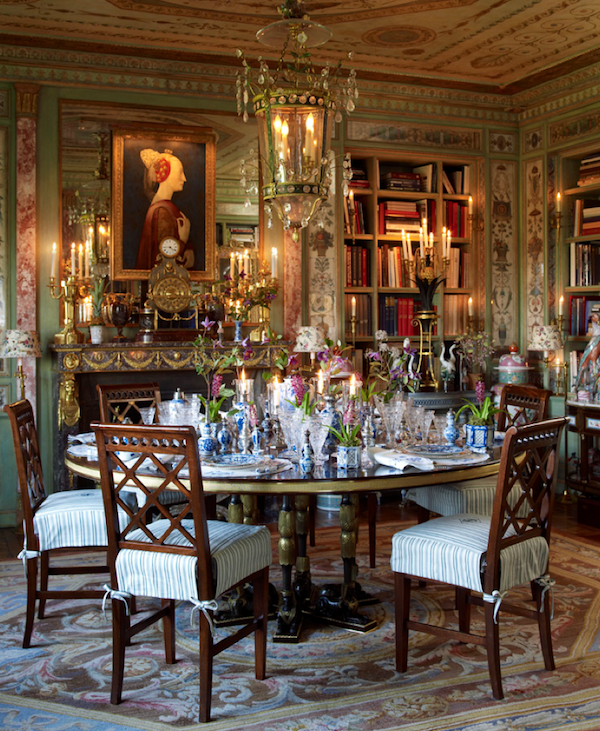 Oh Stacey, you and Susanna have outdone yourselves in Slatkin’s Fabulous 5th Avenue Penthouse! He is a joy and I love that he supports artisans of all kinds! Tres Elegant, Belisiso, & Beautiful !!! What a home filled with treasures and so beautifully arranged. We just wonder if brother Harry’s kids are allowed to visit! I want to capture images of places such as the Menshikov Palace in a watercolor or letter holder. 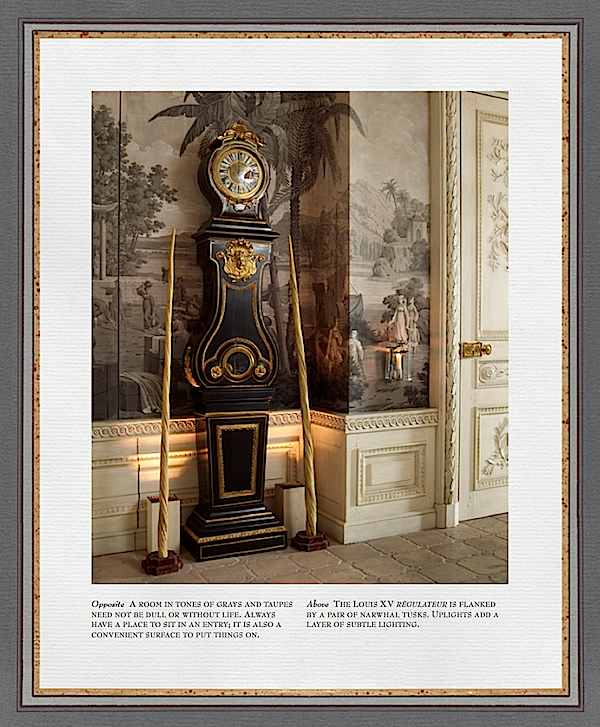 Mr. Slatkin incorporates the elements in gorgeous design and you, Stacy and Susanna, film and share it. We are lucky. I like the opening shot from the end of the hall and Susanna’s statement, “…there’s exuberance here.” This is a fantastic book review and all great joy. How overwhelmingly and unutterably beautiful… I too was breathless and did not want the video to end. A unique man with such vision down to the smallest and most beautiful detail. Thank you! I can hardly wait to curl up with this beautiful book. Kudos on the inside look, not only of the book, but the apartment that inspired it! 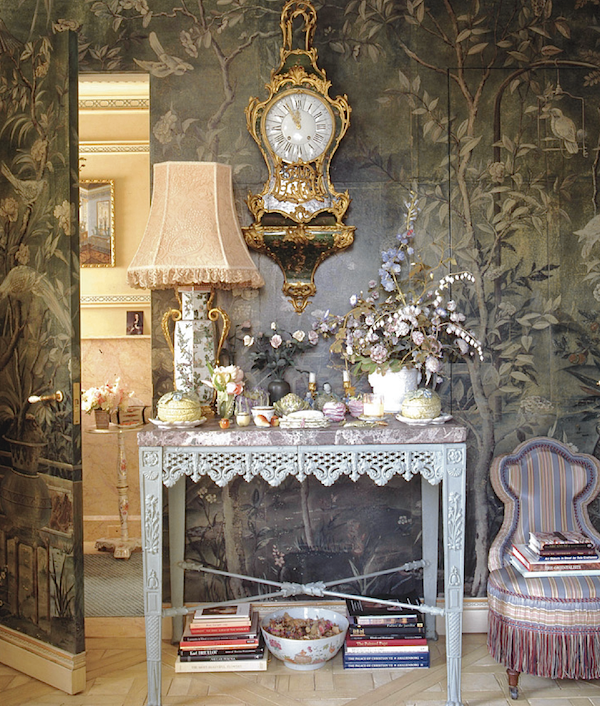 Overwhelmed by the beauty and artistry of Mr. Slatkin’s apartment. A master artist, truly. His book is a treasure! 83 queries in 0.734 seconds.